With just four record companies controlling nearly 80 per cent of the world market in popular music, issues of globalization are evidently significant to our understanding of how and why popular music is made and distributed. As transnational industries seek to open up increasingly larger markets, the question of how local and regional music cultures can be sustained is a pressing one. To what extent does the global music market offer opportunities for the worldwide dissemination of local music within and beyond the major industry? The essays in this volume examine the structure and strategies of the transnational music industry, with its deployment of mass communication technologies including sound carriers, satellite broadcasting and the Internet. The book also explores local and individual experience of global music and this music's dissemination through migration and communities of interest, as well as the ideological and political use of different kinds of music. In contrast to recent arguments which posit an American imperialist dominance of popular music, the contributors to this volume find that the global repertoire of the major labels no longer represents the culture of a certain country but is fed by different sources. The essays here discuss how we can characterize this vast de-centered industry, and offer perspectives on the so-called 'international repertoire' that calls for a melodic structure, ballad forms, unaccented vocalisation and an image that has global recognition. 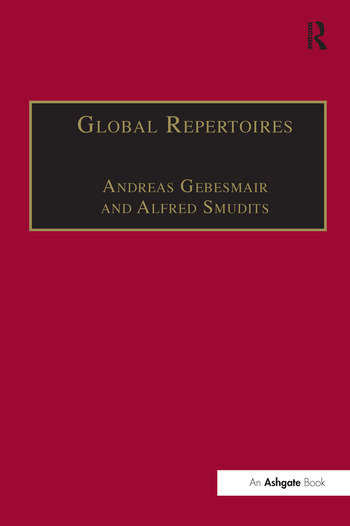 Contents: Preface; Introduction, Andreas Gebesmair; Structures and strategies of the transnational music and media industry: Global strategies and local markets: explaining Swedish music export success, Robert Burnett; The corporate strategies of the major record labels and the international imperative, Keith Negus; One planet - one music? MTV and globalization, Keith Roe and Gust de Meyer; Beyond the transnational music industry - the global use and abuse of popular music: Sampling the didjeridoo, Susanne Binas; Race, ethnicity and the production of Latin/o popular music, Deborah Pacini Hernandez; Popular music in ex-Yugoslavia between global participation and provincial seclusion, Alenka Barber-Kersovan; Globalization - localization, homogenization - diversification and other discordant trends: a challenge to music policy makers, Krister Malm; Music policy between safeguarding and chauvinism, Alfred Smudits; Approaches and methods: popular music research between ’production of culture’ and ’anthropology’: Up and down the music world. An anthropology of globalization, Joana Breidenbach and Ina Zukrigl; Globalization and communalization of music in the production perspective, Richard A. Peterson; Measurements of globalization: some remarks on sources and indicators, Andreas Gebesmair; Hubert von Goisern’s Austrian folk rock: how to analyse musical genre?, Harald Huber; Index.